Discussion in 'Detailing' started by odom117, Aug 20, 2018. 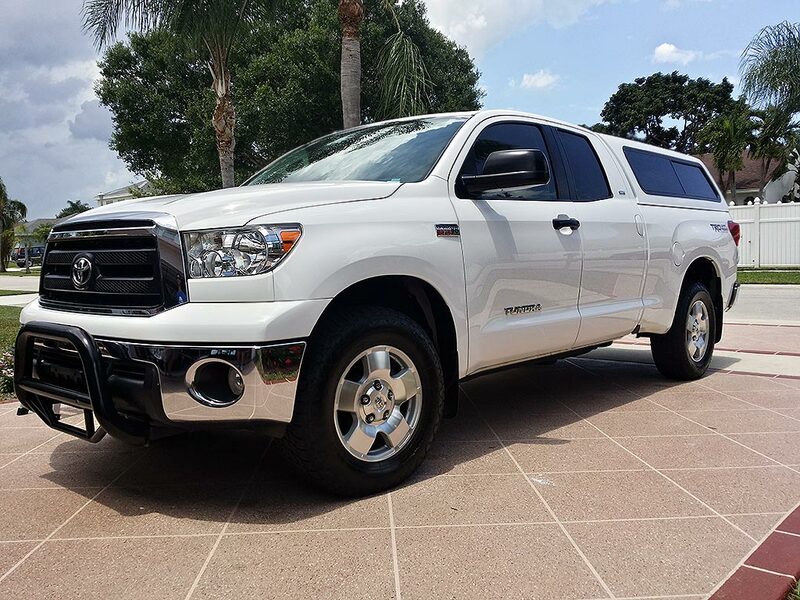 Just got an '05 white tundra. It's been kept in great shape. But, the paint is looking faded and I want to do what I can to bring it back and keep it from starting to peel. Any recommendations on bringing old paint back to life and preventing further deterioration? When detailed correctly it should sparkle, be crisp, clear and have a brilliant glaring (snow blinding) shine. Any recommendations on bringing old paint back to life and preventing further deterioration? You mentioned "starting to peel"? Do you have any spots or sections that have currently have clear coat failure? lots of elbow grease, use dawn dish to wash to get tar , oils dirt off, clay bar or clay bar spray vehicle, a cleaner or cleaner wax , and use collinites double coat or insulator wax, put on two coats. since it has not been waxed in a long time. Joe's on it! Buy a porter cable random orbital polisher... Order a bunch of foam pads from a detail shop. Wash the hell out of it with dawn. Mask off chrome, mirrors, handles and anything you don't want spattered. Park in the shade. Get a light compound that is for de-swirling. Work one panel at a time. Keep a flashlight to check your progress. Buff out the entire truck. Stubborn areas will take two or three times. Get some collonites 845 insulator and put on a LIGHT coat. It barely looks like it is going on. Two coats. Un mask and enjoy. You can skip the clay bar if you are compounding it. Keep the pads clean and swap them if they get dirty. Get some foam applicator pads for the wax, and some micro fiber towels. The above process is a 6-8 hour day. There ain't no magic spray that does this! Not yet. Paint seems to be in good condition, just looks dull. Doesn't have the shine that a new truck would. Which, seems expected for a 13 year old truck. Just wondering what I can do to bring it back! Iron-X and clay bar will make a big difference. I’d try that before investing in a polisher to see if that’s good enough for you. Merlin, Capt J-Rod and SouthBoundSteve like this. War Machine has solid advice too. Once you get what you are after then you will need a clay kit and iron-x to maintain it, so you won't be out anything. Older paint jobs require more effort to keep them alive. My topper is painted fiberglass and the wax doesn't hold up as well as on the paint of my 2015. The good news is that white is the easiest color to bring back in my opinion. Red and blue are the worst with fading, and black swirls if you look at it funny. Finally once it is back to shiny then no drive through carwashes and use two buckets when you hand wash. One for soap and one for rising the sponge before getting more soap. Another idea is to find a good detail shop and get a quote. $250 goes a long way! White, Red and I think Black Toyota vehicles do not use clear coat. The chalky look you see is due to this. But this also makes it very easy to shine back up by the method already mentioned. Give it a good buff and wax and it will look like new. Iron-X and clay bar will make a big difference. I’d try that before investing in a polisher to see if that’s good enough for you. Rinse the vehicle "In the Shade". Touch the paint. If it's too hot to touch it's too hot to work on. While it is wet, spray IronX on the paint (do not let it dry) and massage in with a foam wax application. Rinse off...you should/will see purple rinse away. Using a diluted mixture maximum 10:1 of Immolube and (distilled) water spray and use a "clay bar". I personally like the Nanoskin FINE grade wash mitt or towel. Spray the towel and the paint surface. Wipe the mitt/towel over the paint surface and you should feel (and hear) grit being removed. Afterward, do a Two Bucket Wash Method and completely wash the paint. At this point, you will have "clean" paint. Check to see if it's still "foggy". War Machine and Pudge like this. I bought a 30 dollar random waxer thing from autozone. Waxed in twice in a few months with turtle hard shell wax. Improved like crazy from the flat chalky look it had when I got it a year ago. It still has swirls but I don't really mind them thaaaat much because it still is a truck and its 11 years old. It's a 2007 and it's the best vehicle I've ever owned. If I wanted the swirls out I'd have a pro do it. I tried scratch x and turtles brand swirl remover and didn't do anything. I bought a 30 dollar random waxer thing from AutoZone. Waxed in twice in a few months with turtle hard shell wax. Improved like crazy from the flat chalky look it had when I got it a year ago. It still has swirls but I don't really mind them thaaaat much because it still is a truck and it's 11 years old. It's a 2007 and it's the best vehicle I've ever owned. If I wanted the swirls out I'd have a pro do it. I tried scratch x and turtles brand swirl remover and didn't do anything. The $30 waxer thing is pretty useless but it's "kinda ok" for applying wax. I personally think it is just as easy (or easier) to do it by hand. Collinite 845 and a foam wax applicator pad. The truth is I don't really know that much about it.. what is a dual action polishing machine? I will definitely check that wax out and the waxer thing helps because my hands get too tired as I have a slight arthritis in them. I would remove the U shaped handle and add a 5" Meguiars DBP5 backing plate. Next, I would get a set of Lake Country 5" foam pads 6) from cutting to polishing. To start (newbie) I'd use Meguiars Ultimate Compound and Ultimate Polish. They are available at you local auto parts store (or Walmart) and a consumer safe. 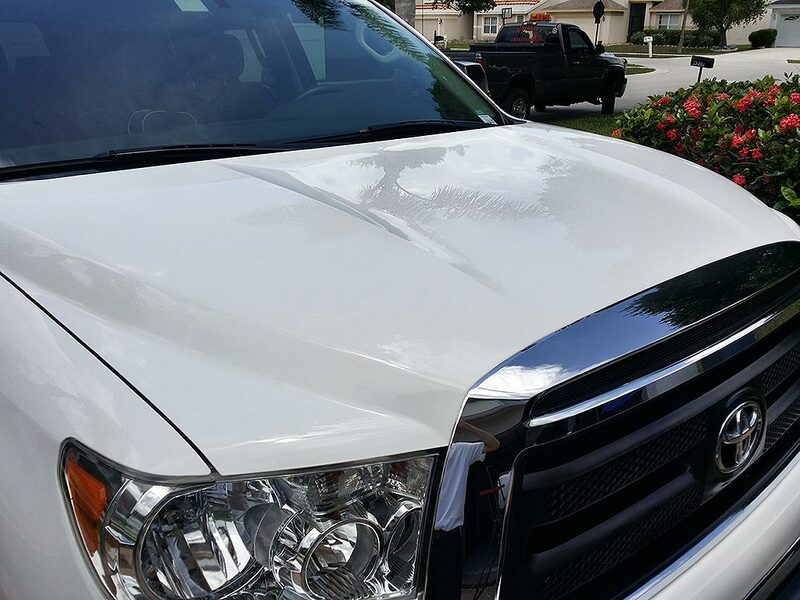 Clean polish residue off with an Isopropyl Alcohol (IPA) 15:1 or Carpro Eraser. This is your wax, sealant or coating. This is your "protection" against the elements.